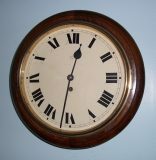 Triple weight Westminster chime wall clock made by Franz Hermle & Sohn in Germany with 8 day movement. Oak case with carved oak pediment. 8″ dial with Arabic numerals. Wood rod pendulum with decorative brass pendulum bob. Fully restored with one years guarantee.